Five Media has strongly condemned the attempt on the life of woman journalist Radhika Devakumar last night (Sept. 08th). In a statement, the local media rights group said the correspondent for Tamil newspaper ‘Thinakaran’ for the past eight years’ was shot by unidentified gunmen at her home at Kalladi, Batticaloa. She is still in serious condition at Batticaloa Hospital. Ms. Devakumar also served as the media coordinator for east chief minister Sivanesathurai Chandrakanthan alias Pillayan for a short period. At a media awards presentation last year organized by Five Media, she was recognized for her services to the field. The statement urges authorities to conduct a speedy investigation and bring the culprits to book. මඩකලපුව ප්‍රාදේශීය ජනමාධ්‍යවේදිනී රාධිකා දේවකුමාර්ට ඊයේ (සැප්තැම්බර් 8 වැනිදා රාත්‍රියේ) නාඳුනන තුවක්කුකරුවන් විසින් වෙඩි තබා ඝාතනය කිරීමට දරන ලද උත්සාහය අප මාධ්‍ය සංවිධාන තරයේ හෙළා දකී. ඇය, පුරා වසර අටක කාලයක් තිස්සේ ලේක් හවුස් ආයතනයේ “තිනකරන්” පුවත්පතේ ප්‍රාදේශීය මාධ්‍යවේදිනියක ලෙස කටයුතු කරයි. මඩකලපුව කල්ලඩි ප්‍රදේශයේ පිහිටි ඇගේ නිවසට ඊයේ රාත්‍රි 7.40 ට පමණ පැමිණි නාඳුනන තුවක්කු කරුවන් පිරිසක් මෙම ප්‍රහාරය එල්ල කර තිබේ. ඇගේ උරහිසට, පපුවට හා උදර ප්‍රදේශයට වෙඩි ප්‍රහාර 3ක් එල්ල කර තිබිණි. දැනට ඇය මඩකලපුව ශීක්‍ෂණ රෝහලේ දැඩි සත්කාර ඒකකයේ ප්‍රතිකාර ලබමින් සිටී. ඇගේ තත්ත්වය තරමක් බරපතල බව මඩකලපුව රෝහල් ප්‍රකාශකයකු අප සංවිධාන වෙත කියා සිටියේය. රාධිකා දේවකුමාර් “ඉන්ටර් නිවුස්” ගුවන් විදුලි ජාලයේ කල්මුණේ මාධ්‍ය නිවසේ නිෂ්පාදක වරියක් ලෙස ද කටයුතු කළාය. ඊට අමතරව ඇය මඩකලපුව කල්ලඩි ප්‍රදේශයේ “මාධ්‍ය සංවර්ධන සංවිධානය” නමින් රාජ්‍ය නොවන සංවිධානයක් ද පවත්වාගෙන ගියාය. “ශක්ති” රූපවාහිනි සේවයේද ප්‍රාදේශීය මාධ්‍යවේදිනියක් ලෙස ඇය සේවය කර තිබේ. නැගෙනහිර ප්‍රධාන අමාත්‍ය සිවනේසතුරෙයි චන්ද්‍රකාන්තන් හෙවත් පිල්ලෙයාන් ගේ මාධ්‍ය සම්බන්ධීකරණ නිලධාරිනිය ලෙස ඇය ඉතා කෙටි කාලයක් කටයුතු කර ඇත. අප සංවිධාන සමූහය විසින් පසුගිය වසරේ සංවිධානය කරනු ලැබු මහජන සේවා ජනමාධ්‍ය සම්මාන උළෙලේදී විවිධත්වය ඉවසීම පිළිබඳ ජාතික සම්මානයෙන් ද ඇය පිදුම් ලැබුවාය. ප්‍රාදේශීය වශයෙන් මාධ්‍යකරණයේ යෙදී සිටින මාධ්‍යවේදීන්ට සහ මාධ්‍යවේදිනියන්ට එරෙහිව පසුගිය කාලය පුරාම මෙවැනි මරණීය තර්ජනයන් එල්ලවිණි. මෙවැනි සිදුවීම් වැඩි වශයෙන් වාර්තාවූයේ යුධමය වාතාවරණයක් පවතින උතුරු නැගෙනහිර පළාත් වලිනි. මෙවැනි ප්‍රහාරයන් තරයේ හෙළා දකින අප මාධ්‍ය සංවිධාන පෙන්වා දෙන්නේ මාධ්‍යවේදීන් මෙසේ නිහඬ කිරීමෙන් ජනතාවගේ තොරතුරු දැනගැනීමේ අයිතිය උල්ලංඝණය වන බවය. එසේම මාධ්‍යවේදීන් හට සිය කටයුතු නිදහසේ කරගෙන යාමට ඇති අයිතියට ගරු කරමින් එය ආරක්‍ෂා කිරීමට කටයුතු කරන ලෙස ද අප මාධ්‍ය සංවිධාන සියලු පාර්ශවයන්ගෙන් අවධාරණයෙන් ඉල්ලා සිටී. එමෙන්ම මෙම වෙඩි තැබීමේ සිද්ධිය පිළිබඳව ස්වාධීන පුළුල්, පාරදෘශ්‍යභාවයෙන් යුත් පරීක්‍ෂණයක් සිදුකර වරදකරුවන්ට එරෙහිව නොපමාව නීතිමය පියවර ගන්නා ලෙස ද අපි වගකිව යුත්තන්ගෙන් ඉල්ලා සිටිමු. ශ්‍රී ලංකා මාධ්‍ය මධ්‍යස්ථානය, අංක 1C 1/1, 28 වැනි පටුමඟ, මල් පාර, කොළඹ 07. I vividly remember a question asked of me by a CID officer, i.e. “Did you try to overthrow the government?” I replied, “I have not tried but I have a right to do so. But I shall not try to overthrow the state. The CID officer was perplexed. So, I explained him the difference between the state and the government. I sensed that he was inwardly enlightened. The campaign by the International Federation of Journalists (IFJ) against the arrest and indictment of senior Tamil journalist J.S. Tissainayagam is the first campaign associated with a mainstream journalist, who also edited the website www.outreachsl.com, that Groundviews has chosen to highlight. It will hopefully be the last. Groundviews has to date eschewed publishing civil society and NGO driven media campaigns on peace, human rights and democratic governance. This was largely out of an interest to support and strengthen Groundviews as a place for and source of original writing and lively debate. Therefore, the decision to feature and unequivocally support the campaign to release Tissa by the International Federation of Journalists (IFJ) was not arrived at easily. Salient points of Tissa’s case point to a larger and more chilling deterioration of media freedom in Sri Lanka under the Rajapakse administration. Tissa’s case in particular reveals a particularly twisted logic, and through it, confirms fears that the regime in the South now completely mirrors the intolerance of media freedom and free expression the LTTE is known and reviled for. ‘Such offensives against the civilians are accompanied by attempts to starve the population by refusing them food as well as medicines and fuel, with the hope of driving out the people of Vaharai and depopulating it. As this story is being written, Vaharai is being subject to intense shelling and aerial bombardment’. Embarrassing the Sri Lankan government, or bringing it into disrepute is thus one of the key charges against Tissa. A flippant response that matches the absurdity of the charge would be that the government itself does more than any one else to bring itself into disrepute, with sickening frequency to boot. But a more considered response is required, and that is what this campaign by IFJ seeks to generate. This Editor does not know of any law in Sri Lanka that makes journalism critical of government a criminal offense. If there is such a law, DEW Gunasekara, the Minister of Constitutional Affairs and National Integration, should be immediately imprisoned and charged in the same manner as Tissa. The excerpt published above, taken from the Minister’s diary notes and published exclusively on Groundviews clearly expresses the right of any citizen to criticize and even attempt to overthrow the government. How will the regime countenance this train of thought by one of its own Ministers? Tissa’s case is more than a set of ludicrous charges against an individual. The charges, the length of time he was held without any charge and the manner in which he was treated while imprisoned are all carefully engineered to generate fear and anxiety amongst independent journalists and media. In this, the Rajapakse regime has been tremendously successful. Most journalists today are fearful of even writing about Tissa’s case, much less writing publicly against his unjust predicament or agitating for his quick release. Yet Tissa’s charges call for defiance and outrage. Every blogger, every journalist, virtually everyone who has articulated an opinion in public through any media should take very careful note of the charges against Tissa. Their nature place us all at risk of arbitrary detention and criminal charges. Please support the campaign to free Tissa. The International Federation of Journalists (IFJ) and its local affiliates in Sri Lanka today launched an online campaign video condemning the arrest and indictment of senior Tamil journalist J.S. Tissainyagam, whose passed his sixth month in jail on September 7. 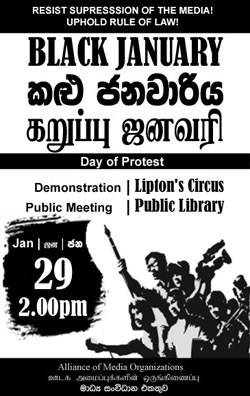 All individuals and organisations are invited to join the campaign to Stop the War on Journalists in Sri Lanka and watch the “Release Tissa” video at http://asiapacific.ifj.org/articles/free-tissainayagam to help generate international support to end the attacks on free media in Sri Lanka. Tissainayagam was arrested on March 7, 2008, while working as the editor of the online magazine www.outreachsl.com. After being held for five months without charge, Tissainayagam has been formally indicted by the High Court of Sri Lanka under emergency and anti-terrorism laws, according to the Free Media Movement (FMM), an IFJ affiliate. The indictment reportedly refers to the printing, publishing and distribution of the North Eastern Monthly between June 1, 2006, and June 1, 2007; alleged offences to do with bringing the Government into disrepute; and the violation of 2006 Emergency Regulations with regard to allegations of aiding and abetting terrorist organisations through raising money for the magazine. “The indictment against Tissainyagam in a country where journalism and journalists already face extreme threats marks a dangerous turning point for freedom of expression and the right to information in Sri Lanka,” IFJ Asia-Pacific said.